Tuesday February 7th 1922 I got up very late. Weather pleasanter. The girls both home all day, Hattie to concert in evening. Lula Towns here all night. Wednesday February 8th 1922 Did nothing in forenoon. Wrote some in this book. The girls out for supper. Letters from Laura and Lou Duncan. Wrote her and Nellie. Thursday February 9th 1922 The girl went away at noon. Rob & me dinner together. I read and wrote some. Dr Smith here at supper time. Hattie to prayer meeting. I to Mrs Broadways. Rob & Cora brought us home. Friday February 10th 1922 I got dressed before dinner and Rob took me over to Aunt Emmas for the afternoon. The girls both at home. Read in evening. 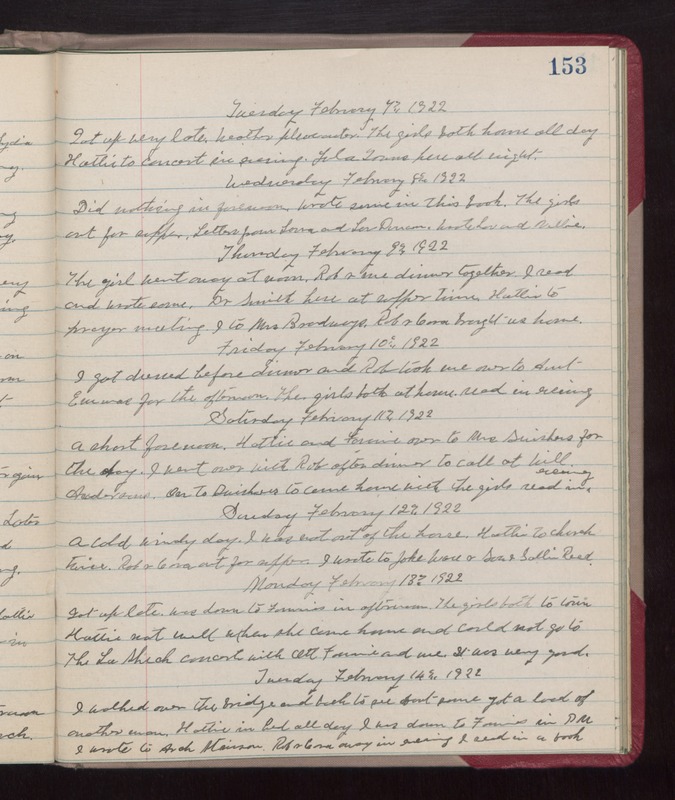 Saturday February 11th 1922 A short forenoon. Hattie and Fannie over to Mrs Swishers for the day. I went over with Rob after dinner to call at Will Andersons. On to Swishers to come home with the girls. Read in evening. Sunday February 12th 1922 A cold windy day. I was not out of the house. Hattie to church twice. Rob & Cora out for supper. I wrote to Jake Ware and Sue & Sallie Reed. Monday February 13th 1922 Got up late. was down to fannies in afternoon. The girls both to town. Hattie not well. When she came home and could not go to The La Shick concert with Ott, Fannie, and me. It was very good. Tuesday February 14th 1922 I walked over the bridge and back to see about some got a load of another man. Hattie in bed all day. I was down to Fannies in PM. I wrote to Arch Stinson. Rob & Cora away in evening. I read in a book.